With a more brooding, less goofy Fantastic Four movie headed to theaters this weekend, it’s time to get up to speed one of the first superhero teams to wear coordinating outfits. Halloweencostumes.com is preparing audiences for the reboot (and for October costume purchases) with a retrospective of the Richards’ numbered ensembles, as told by the Invisible Woman herself, Sue Storm. 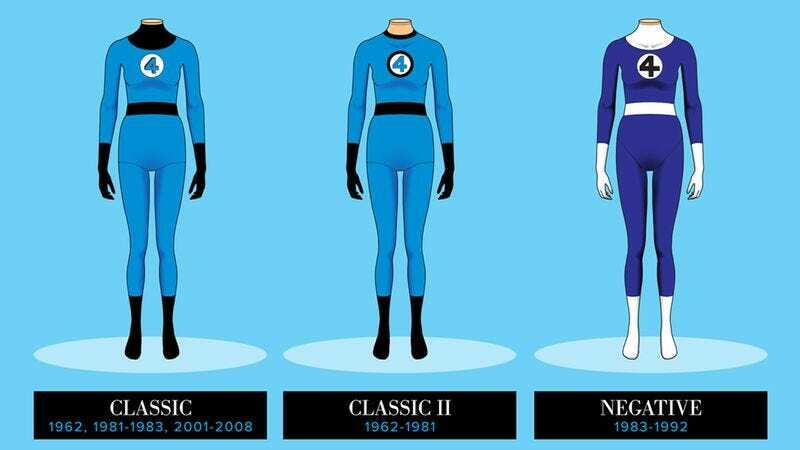 Most of the Fantastic Four’s uniform changes (at least Sue Storm’s versions of them) is presented along with commentary from Storm. The illustrations aren’t credited here, but appear to be the work of Kate Willaert, who is behind other Halloweencostumes.com retrospectives, including Spider-Man and Wolverine. High points for the collection include Classic II, The S.H.I.E.L.D.-inspired Heroes Reborn, and the snappy Future Foundation uniforms. But the less said about the Negative II, the better.